About two years ago I was introduced to the Marie Kondo way of life via her book The Life Changing Magic of Tidying Up. I became an instant fan and embraced her philosophy of only owning things that "spark joy" with gusto. A few months later I discovered the capsule wardrobe blog Unfancy and was ready to whittle my wardrobe down to the essentials. Last Spring for the first time ever I was ruthless about what I "put out" for the season and it was a game-changer. 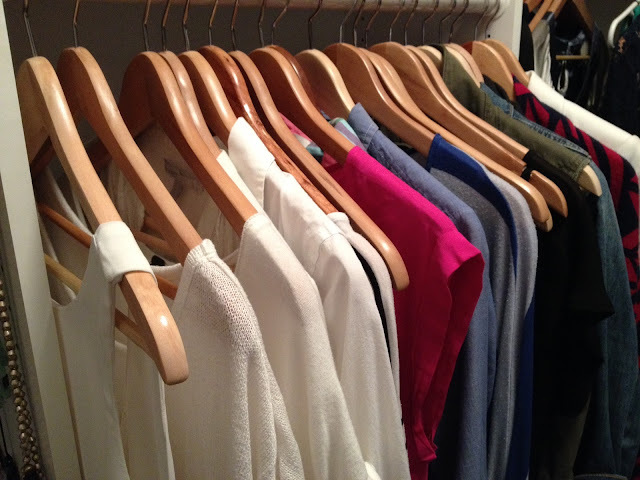 I pared down my closet to only things that I loved, that fit me well and that weren't redundant. Suddenly I didn't have six button downs, I had one classic white Oxford and one chambray button-down. No more random t-shirt drawer full of freebies I never wore, I pared those down to six that all worked together with the other items I owned. This will be my third season of taking the time to evaluate my wardrobe in this way and I actually get so excited about it now. I've found spending half an afternoon at the start of a new season evaluating my clothes saves me a ton of time throughout the season. Setting aside time to think about what I will be wearing in the months ahead means I actually spend very little time thinking about getting dressed each day. 1. 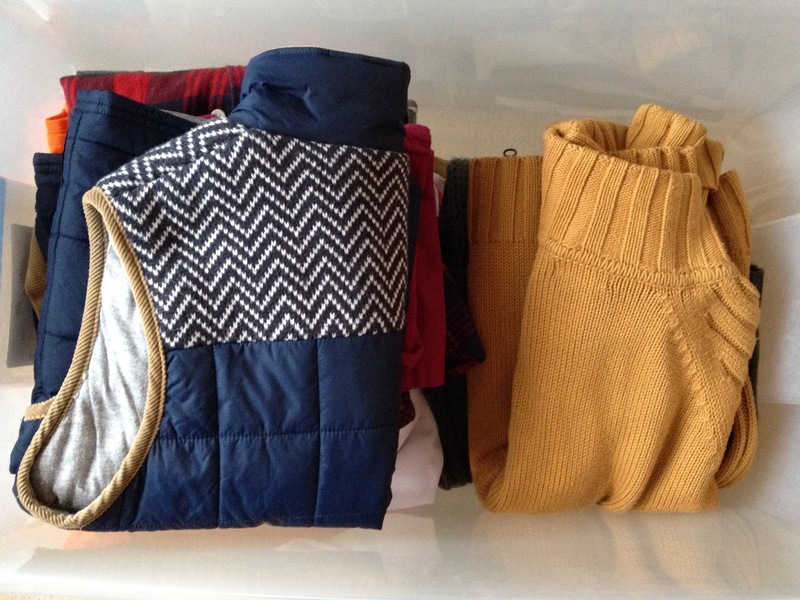 Pull out, clean, fold and store away any clothes that will not transition into the new season. I always have a bag on hand for items that I never ended up wearing (these will go straight to Goodwill) and I'm ruthless about trashing clothing that has rips/stains/doesn't fit anymore or is beyond repair. I want to be thrilled when I open this box up again come Fall and not overwhelmed by a bunch of clothes that don't work for me anymore. 2. Shake out everything from the storage box and hang or fold and put it in its place. If there are items I'm not sure I'll wear this season but don't have the heart to give away - I put them in my bottom dresser drawer. Marie Kondo would not approve, but I tell myself that if they aren't called up for duty during the season I will give them away when it's over. I also organize my hanging and folded clothes from light to dark because I'm neurotic. 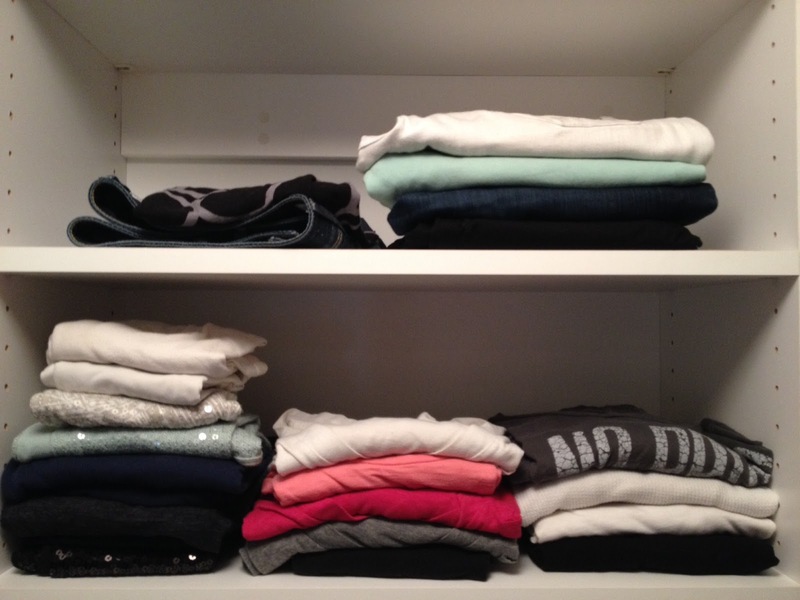 The folded clothes will not stay like this for long, but they are so pretty to look at right now. 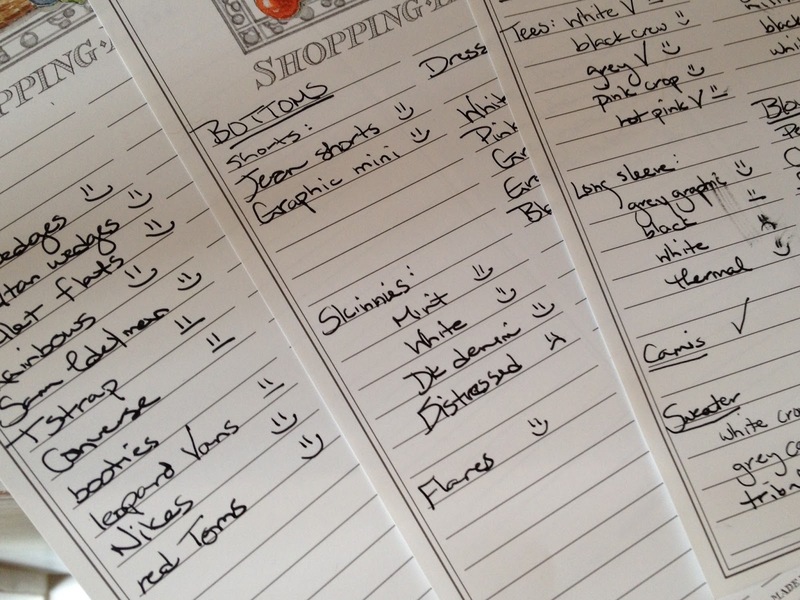 I categorize and write down EVERY CLOTHING ITEM I OWN. Workout gear, PJs and undies don't make the list, but everything else does. Looking at 3 slightly different plaid shirts in my closet doesn't phase me, but when I write down "plaid shirt" "plaid shirt" "plaid shirt" I see the issue more clearly. 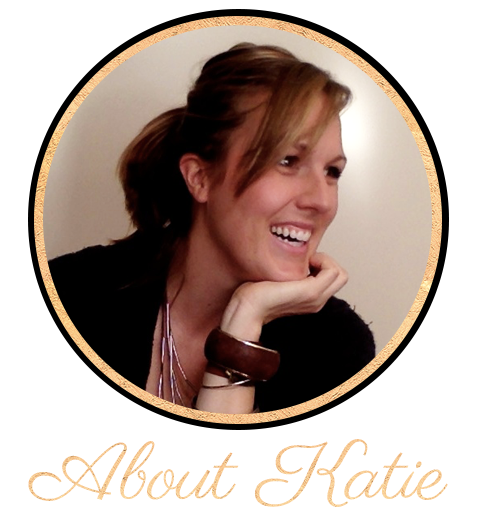 No More Plaid Shirts Katie. When I'm making my list, I put a smiley face, a wah-wah face or a frowney face next to each item. (Because I'm sophisticated like that.) The smileys are things I LOVE wearing. They fit well, they make me feel pretty and they're in good repair. Wah-wah items are ones I'd like to replace with something nicer/better quality/better fit when I have the opportunity. Frowney faces are essentials (to me) that just don't work anymore. This season it's my distressed jeans (they got WAY too distressed last week when I bent down to pick up a child...) and my white V neck tee. The tee is a cheapo from Target and it never makes me happy. Every time I put it on, I take it right back off and reach for my grey V neck instead. It needs to go and be replaced by the perfect white V neck. Light wash distressed denim jeans in boyfriend or skinny cut. Having all of these things would be great, but it probably ain't gonna happen this season. It does help that Christmas and my birthday are on opposite ends of the year, so wardrobe-related gifts help freshen things up without breaking the bank! So that's my process. My closet feels totally fresh and new and I have a short and highly specific list of items I'm on the hunt for. 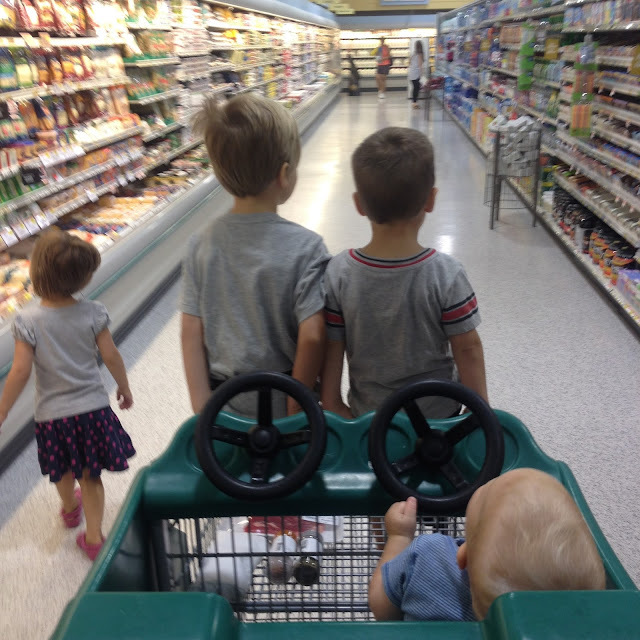 Your turn to share! Do you switch out your clothes each season? 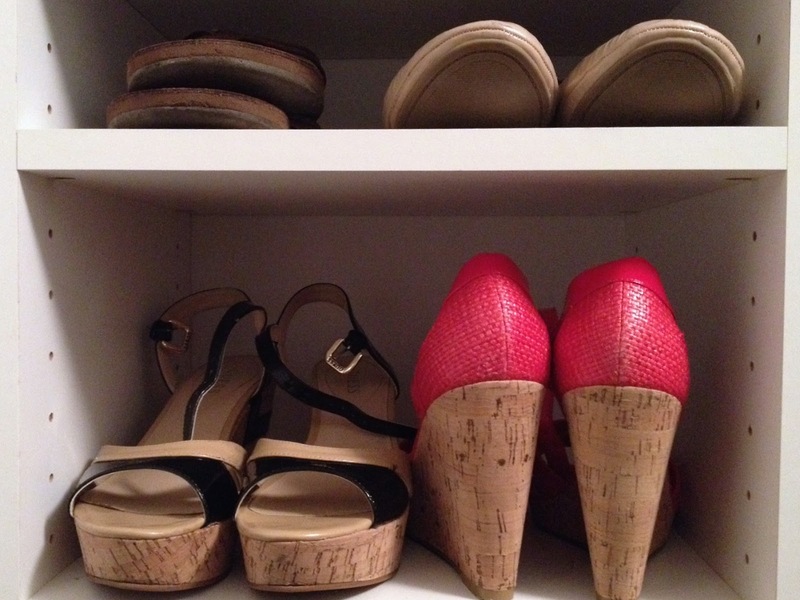 Does Marie Kondo overwhelm you or are you a devotee like me? What's on your must-have for Spring/Summer clothing list?